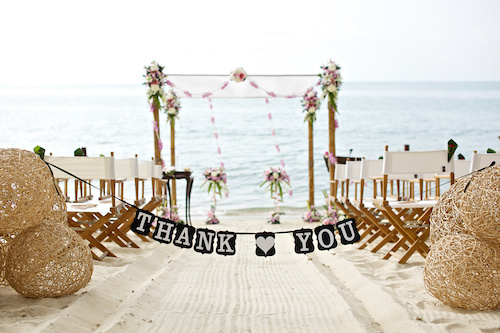 A destination wedding thank you is particularly important. Guests who traveled out of their way to share in your special day as well as those who sent a gift in lieu of being able attend deserve to know how much you truly appreciate them. If you need to also include a thank you for a gift in addition for attendance you can combine the wording with the gift-specific wedding thank you notes found here. Since the gift of cash or gift certificates and donations for help with the honeymoon or wedding, I have dedicated a special page for thank you for the wedding support and wedding cash gifts. There are a few ways you can handle a destination wedding thank you. You can include as part of the wedding favors a special thank you note that thanks your guests for traveling to be with you both on your special day. There are some great favors that tie in perfectly with destination weddings like the beach favor available from My Wedding Favors on the left. • Thank you for traveling to share our special day. • Thank you for being with us today. • Love knows no bounds. Thank you for coming to Hawaii (insert destination) with us. • Thank you for the joy of your company today. • We are so glad you could be here today. Thank you. to be with us on our special day. And of course you can also include a special thank you for traveling to your wedding in the gift thank you and/or you can do all of the above. Also check out the thank you for coming poem, wedding poem, and other wedding thank you posts. Due to the expense of traveling, be aware that some guests will not be able to afford more expensive gifts for your wedding. Be particularly gracious when sending a thank you note for a destination wedding to acknowledge the joy of having your guests attend. Here are a few samples for guests who were in attendance. Thank you for the lovely silver tea set (or insert gift) and for traveling to Las Vegas (or insert other destination). We appreciate the extra effort and time it took for you to come to the wedding. Your presence made the day that much more special. We love the silver tea set (insert gift) and will think of you every time we use it. Thanks again for everything. • Thank you for joining us in Honolulu (or insert destination) for the wedding. We know it was a considerable expense of time and money, and we are truly grateful that you were there. Your presence made it that much more of a special occasion. Thank you. • Thank you for joining us on the cruise (or in insert destination) for the wedding in addition to your very generous gift. We are saving it for a down payment on our new home. Your generosity is greatly appreciated. Thanks again. • Thank you for coming to the wedding and for the thoughtful candle. Your presence at the wedding was a gift in itself, and the candle was beyond generous. We appreciate you traveling such a distance to celebrate our special day, your well wishes, and the lovely candle. You are a great friend. Thanks again. Tip: There is no need to mention that the invitee was unable to attend the wedding unless you know for a fact they are worried you are upset they could not attend. It is perfectly fine to acknowledge their gift and well wishes in your destination wedding thank you. Here are some samples. The first is thanks for the gift (see more gift-specific wedding thank yous here) and the two latter examples acknowledges that they will not be able to attend. • Thank you for the gorgeous ceramic vase (or insert gift). It will look stunning in our new living room. You have amazing taste. Thanks again. • Thank you for the elegant monogrammed towel set. Enclosed is a wedding photo. Your presence at the wedding would have been wonderful, however, we know you would have attended if it were possible. We truly appreciate having you in our lives and your wonderful gift and well wishes. Thanks again. • Thank you for the beautiful crystal wine goblets. We will be sure to raise a glass in thanks to the generous friends who gave them to us. We will miss you at the wedding, but completely understand that having our wedding in Buenos Aires makes it difficult for you to attend. Your generous gift and well wishes are more than enough. Thanks again.